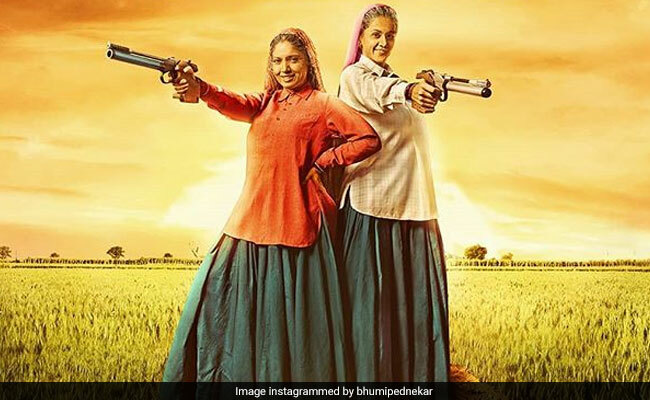 Bhumi Pednekar said: "It's a true story of... these women who have changed the ecosystem for women and society around them"
Actress Bhumi Pednekar says Chandro and Prakashi Tomar - two octogenarian sharpshooters from Uttar Pradesh - changed the ecosystem for women and society around them. Starring in director Tushar Hiranandani's Saand Ki Aankh, Bhumi will play the character of Chandro Tomar in the upcoming film. It also stars actress Taapsee Pannu, who will play the role of Prakashi Tomar. "These two women by sheer stroke of luck become sharp shooters. They travel the world, they are given incredible recognitions, they make our country proud but no one really knows how they fought their house, the society to make a difference in the lives of their grand-daughters and bring positive change for women in their male-dominated community. It is an extremely powerful story," Bhumi said in a statement. The Dum Laga Ke Haisha actress said that Saand Ki Aankh is a film about the triumph of human spirit and faith. "It's a true story of courage because you have these women who have changed the ecosystem for women and society around them," she said. The first look of the movie was unveiled on Tuesday. Dressed in a shirts, ghagras with a chunders, Bhumi and Taapsee have grown into the skin of their characters of Chandro and Prakashi. Bhumi added: "The shooting has been an incredible experience for me. As an artiste, you really hope that you get a film like this in your career and I'm fortunate to have this in my bag. It has been an absolute honour getting to know these incredible women and having the chance to play Chandro on screen." "I was bowled over by the script from the word go because it is such an entertaining yet inspiring film," she added. Chandro, 87, and Prakashi, 82, are from Uttar Pradesh's Johri village and reportedly took up sharpshooting in their 50s. Chandro, who is fondly called shooter 'dadi' is among the world's oldest female sharpshooters. Saand Ki Aankh also features Prakash Jha and Vicky Kadian in pivotal roles.